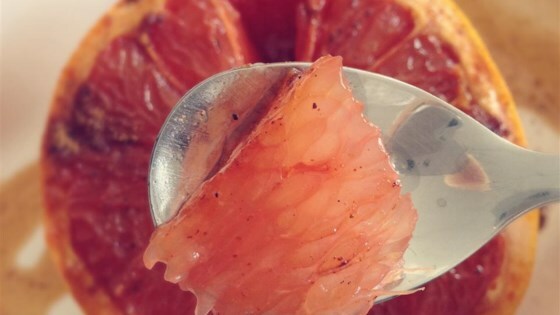 "This spiced broiled grapefruit works really well as part of breakfast or an anytime snack." Cut around the edges where the fruit meets the peel of each grapefruit half to loosen the fruit. Sprinkle cinnamon and nutmeg over each half and top with coconut sugar. Place grapefruit halves on a baking sheet or in a loaf pan. Broil in preheated oven until sugar is browned, about 7 minutes. Allow to cool at least a few minutes. Raw honey can be substituted for the coconut sugar, if desired.